Lea St Barth is by Calypso St. Barth, and the notes include almond, vanilla, and musk. Background information on the Calypso St. Barth line is scarce, but it seems to be a boutique on the Caribbean island of St. Barthelemy, not to be confused with Christiane Celle's Calypso, which also hails from St. Barth. The island is also home to Ligne St. Barth. There must be something in the water there that inspires fragrance creation, or perhaps it is just the island's status as stomping grounds for the rich and famous; W Magazine notes that it is "a Caribbean paradise where they can bask on the beach (with other people just as rich) and score impossible-to-find Hermes bags" (11/1/2004). Anyway, back to Lea. The top notes are very nearly a dead ringer for almond extract. Vanilla extract joins in fairly quickly, and for a brief time, it smells very much like those crunchy little Amaretti cookies topped with sugar. After that, it softens and gets milky-powdery and a bit less foody. There is lots of very clean (almost soapy clean) musk and the tiniest blur of sheer florals. It gets warmer the longer it is on skin, and after an hour or so, there is a subdued undertone of dry cocoa powder. There is nothing much to it, but I should think that is part of its appeal: it is simple, warm and comforting, and not as overly sweet as it might sound. I have never really wanted to wear it, but it is widely adored, and if I had expanded my recent list of Five Cult Classic Fragrances to 10, Lea would certainly have made the list. If yesterday's Vanille Exquise wasn't what you wanted in an almond-vanilla gourmand fragrance, Lea might be exactly what you're looking for. 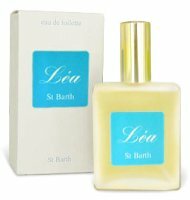 Lea St Barth is an Eau de Toilette. I have seen complaints about the lasting power, but I find it makes it most of the way through the day. For buying information, see the listing for Calypso St Barth under Perfume Houses. I think the most fascinating thing about Lea is how truly impossible it is to get background info on the Calypso St. Barth line. I remember Scarlett went to great lengths to find info, but never did come up w/ anything substantial. I can objectively appreciate the scent, but it's definitely not one I can wear. My guess (and it is nothing more than that) is that at some time in the past, Calypso St Barth & Christiane Celle's Calypso were the same thing, and that they split up, as it were, and failed to work out who was going to get rights to the name. All else I know is that Liliane Jossua is supposed to be the owner of “Calypso St Barth” and she is also part owner of the Montaigne Market in Paris. I'll share a story with you. It's a sad story. I heard of Lea when I lived in England, where, as far as I knew then, it was not available. So for a long time I longer to try this fantastic elixir, described in such glowing terms on MUA. This was the first decant I bought as soon as I stepped on the American soil. …Typically, the reality could not live up to the super-high expectations I had. I don't know what is it in Lea that causes it to turn ever so slightly sour on me, but it does. It is very “pale” and sour on me…*sigh* The second decant I bought was POTL. I've never sniffed either of the Calypsos. Are they similar? LOL — I am weeping for you M! I can only assume your third decant was WAY more pleasing or presumably you would have given up on perfume. Do you mean is Lea similar to Jala? If so, no, Jala is more of a tropical floral sort of thing. I suppose it is true that they both “decidedly lack sophistication”, although in the scheme of strictly comfort scents, to my mind you could do a lot worse! I tried the Extreme only once and I seem to remember that I didn't like it as well as the regular, but I can't remember why. Maybe the Extreme was sweeter? Yes, I think the Extreme is both sweeter and more powdery. And you're very right about comfort scents. I love Lea, but in a guilty pleasure kind of way. Sometimes I wonder if I'm too old to wear it in public. I don't feel this way about Lei, for some reason. Have you tried PG's Musc Maori? I've found it to be quite similar to Lea when on my skin. I really like the Musc Maori. It is more “fun” than Lea, if that makes any sense at all.